This space is miserable and I never see anyone in “the public” using it. It’s no prize for anyone, and it’s amazing that anyone would have tried to use it without a complete re-imagining of the environs. All of EMP’s street-level space is a terrible derelict visually-offensive waste. It gives this publication no credibility to refer to this spot as “popular”… get real. This outdoor area on 24th St. is used every day by people needing a place to sit and rest, by the elderly, by people eating lunch, and is a place for people to talk to their neighbors. It is the only other place at EMP besides the plaza/playgrounds for people to sit and congregate. I know this since I live directly above it, and i know it has been actively used by the community for close to 45 years. It is a well used area by both residents and visitors. Kids play there every time there is a snowstorm, they always have snowball fights, build snowmen and make snow angels there, they ride their scooters and skateboards down the ramp. When there was a Carvel ice cream store, people could sit outside and enjoy a cone with their friends, families and kids, and cool off on a hot summer night.mIt has always been closed at 10PM, and alcohol has never been allowed there. 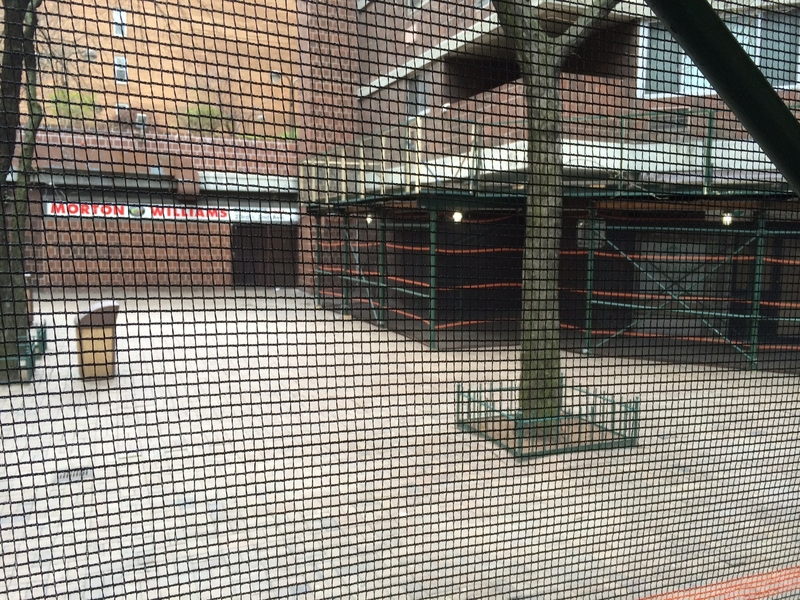 This taco and tequila bar would have changed all of that, and closed off a big part of a public space, bringing in bar-goers, SantaCon bar crawlers, garbage, noise and drunks until 1AM. It was such a bad idea that a huge number of people in the community rose up against it. The community board received a ton of letters in opposition, and many people from EMP and NY Towers showed up to the Community Board meeting to oppose it. It is true that EMP has not kept its public spaces in good repair or renovated them for too many years. All our renovations were put on hold as the board spent eight to ten years and many millions of dollars on lawyers and consultants in a failed attempt to cash in on their apartments by going private. They claimed for all these years not to have the money to renovate, but suddenly all roofs on 7 buildings are being replaced, both levels of the block-long garage are being renovated, the exterior concrete inspected and repaired, new elevator cabs were installed, new security cameras are everywhere, all bike rooms are being renovated, laundry rooms repaired, and at least $5 million in renovations are suddenly in progress. As it turns out the cash flow from our retail stores plus apartments is enough to do all these repairs, especially since as a Mitchell-Lama EMP gets millions of dollars in real estate tax breaks, over $30 million in savings the last decade alone. These monies are finally being spent properly, and residents hope the outdoor and plaza take place soon. As the current renovations underway have proven, we don’t need to serve tequila to drunk college students at 1AM in our outdoor areas to do the major renovations we need. We just need to decide to do them. I agree that you don’t need a wholly disruptive venue to take this space. But then how did negotiations with a Mexican bar get so far that they were considered a serious tenant for the space? Either the bar really did intend to keep a “cafe” atmosphere and that intent was lost in the opposition, or someone’s not doing their job trying to find a good-fit tenant for this space. So glad EMP is finally using funds properly. Hope it continues and people see that privatization is not the answer. Wonder if the majority of residents will vote to stay in the program just as the residents of Penn South.